While other alliums, like onion, garlic, shallot, and scallions, get all the love, leeks are often left on the sidelines—bound to add some flavor to soups, but not much else. However, the mild flavor and crunchy texture of these hearty green leaves are incredibly versatile, and can be enjoyed raw, fried, boiled, and of course in broth-based or creamier, blended soups. They’re also incredibly easy to prepare, and once you get the basics down you’ll undoubtedly be seeking out more leek recipes to work into your recipe rotation. The worst mistake you could make when preparing leeks is not washing them well enough—no one wants to eat something sandy! 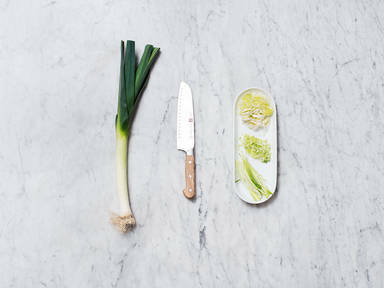 To start, cut off the rooted bottom of the leek, and remove a layer or two of the outer leaves. Cut lengthwise, and rinse well under cold water, gently pulling apart the leaves to wash away all sand and dirt that might be trapped there. Shake and pat them dry. Then, depending on your use, cut the leek into thin strips and mince, or slice into fine half rings. Try frying them up in a drizzle of olive oil, or toss them into a salad, any way you want them—enjoy!